We’d love your help. Let us know what’s wrong with this preview of Company K by William March. To ask other readers questions about Company K, please sign up. When Truman Capote claimed to have created a new literary form, the non-fiction novel,In Cold Blood in 1966, he was about thirty three years behind the times. William March. beat him to the punch in 1933 with his novel Company K.
Recently, I reviewed Patrica Anthony's lost classic, Flanders, the story of a young American, Travis Lee Stanhope and his experience as a young man who volunteered to fight with the British prior to America's entering the war against Germany in World War I. It's a great book. However it had a great predecessor, Company K, by William March. The difference between these two books lies in the difference of the authors who wrote them. Patricia Anthony was born in 1947, in San Antonio Texas. William March was born William Edward Campbell on September 18, 1893, to a dirt poor itenerant farm family near Mobile, Alabama. His father spent the majority of his working life in the logging industry. March to his name from his mother, Susan March Cambell. It was his mother who read to March and his nine siblings, although his hard drinking father was prone to recite the poetry of Edgar Allen Poe when he was in his cups. As one of ten children, March received no special privileges in the family home. March made his own way in the world. He obtained a job as a law clerk in Mobile, Alabama. He went to The University of Alabama School of law, but left in 1916 because he could no longer afford the tuition. That same year, he traveled to New York, New York, obtaining a job as a law clerk with a firm there. A few days after the United States entered the War, March entered the United States Marine Corp, and trained at Parris Island. He emerged as a Sergeant, assigned to March reached France in March 1918, serving as a sergeant in Co F, 2nd Battalion, 5th Marines, 4th Brigade of Marines, Second Division of the U.S. Army Expeditionary Force. March fought in every major American engagement during the war, first at Verdun, then Belleau Wood, the assault on Soissons, the Battle of Sant Mihiel, and alongside the French at Mont Blanc. During the course of his fighting, March was awarded the Croix de Guerre, and the Distinguished Service Cross, second only to the Medal of Honor. As so many other soldiers who saw action in the first great war, March returned to America suffering from acute episodes of depression. March lived with his family in Tuscaloosa, Alabama prior to taking a job at a law firm in Mobile, Alabama. Shortly thereafter, March became the personal secretary of the CEO of the Waterman Steamship Company, eventually becoming vice president of the company. In 1926, March traveled to New York, taking writing courses at Columbia University. His personal experience of encountering a young German Soldier whom he bayonted through the throat continued to haunt him long after the incident occurred. In New York, March finished his first extraordinary novel, Company K. The novel was originally serialized in the Forum Magazine. It was published in 1933. March covers his experiences from training through combat in a series of 113 different vignettes, each chapter devoted to an individual marine. However, the episode that haunted March, the bayoneting of the young German soldier was attributed to a marine named Nate Burt. Company K contains all the horror of war. From the execution of the wounded enemy and prisoners, to the frantic chaos of mustard gas, and the fragging of officers sending their men on suicidal missions, March's novel emerged as the American anti-war novel of World War I. Change the setting to the humid jungles of East Asia, you can easily find the imbroglio of the Vietnam War. March did not win acclaim for his novel. The most favorable criticism came from the British, including Graham Greene and Christopher Morley. "It's queer about this book--it suddenly made me wonder whether any other book about the War has been written in this country. It's a book of extra-ordinary courage--not the courage of hope but the quiet courage of despair. It will make patriots and romanticists angry--yet it is the kind of patriotism that is hardest and toughest. It ranks at once with the few great cries of protest. It is a selected, partial, bitter picture, but a picture we need. It will live. None of the acts of bravery for which the author was decorated during the War was as brave as this anthology of dismay." Simmonds (1988), p. 4, ibid. This is not quite the lost American classic. However, published only by the University of Alabama Press, this is another novel of the caliber of All Quiet on the Western Front, deserving the same readership. This is a book with the staying power of any novel written on the horror of war. Find it. Read it. You cannot forget it. Gli uomini della Compagnia K, soldati semplici, caporali, sergenti, tenenti, sono i protagonisti di questo romanzo corale, definito da Graham Green come “il romanzo più importante che sia mai stato scritto sulla Prima Guerra Mondiale”: ognuno di loro prende parola e ci racconta, in capitoli brevissimi, la sua testimonianza. C’è chi partecipa alla fucilazione di nemici inermi, chi butta via la gavetta di riso perché ha fame di ciò che mangiava prima di arruolarsi, chi dopo aver ucciso un tedesco Gli uomini della Compagnia K, soldati semplici, caporali, sergenti, tenenti, sono i protagonisti di questo romanzo corale, definito da Graham Green come “il romanzo più importante che sia mai stato scritto sulla Prima Guerra Mondiale”: ognuno di loro prende parola e ci racconta, in capitoli brevissimi, la sua testimonianza. C’è chi partecipa alla fucilazione di nemici inermi, chi butta via la gavetta di riso perché ha fame di ciò che mangiava prima di arruolarsi, chi dopo aver ucciso un tedesco ne ruba il pane inzuppato di sangue perché di fame non ne può più, chi scrive poesie, chi riceve medaglie d’onore, chi, preso forse da un raptus, uccide il proprio comandante, chi uccide in maniera gratuita e poi, a guerra finita, verrà perseguitato per sempre dagli incubi. C’è persino un soldato sconosciuto, che caduto sul reticolato, prima di morire, getta via la sua piastrina e il suo numero identificativo per andarsene così, senza un nome da celebrare come eroe. Vittime e carnefici di una stessa guerra. Sono diversi i racconti di questi uomini, dal tono crudele, quasi bestiale, che mi hanno impressionata, lasciandomi in bocca quel sapore di amaro e di macabro che ancora adesso, a lettura terminata, fatica ad andarsene. William Edward Campbell served with the Marine Corps during WWI in Company K of the 3rd Battalion, 5th Regiment, 4th Brigade, within the 2nd Division. Drawing from his personal experiences he wrote this powerful fictitious novel using the pen name William March. From the beginning of the war to the return home the author portrays how one mans life was dramatically changed under the philosophy of “you don’t come out the way you went in”. Really excellent book by the author of The Bad Seed. The war experiences in the story are vivid and powerful, and every character is interesting. Resultaría mucho más sencillo escribir sobre un libro lineal. Por ejemplo: se conocen, se quieren, surgen conflictos y finalmente se casan. O por ejemplo: Un adolescente no encuentra su lugar en el mundo hasta que una serie de avatares solventan la situación. Sería más sencillo, sin lugar a dudas, escribir sobre algo así. Sin embargo, la lectura hubiese resultado menos enriquecedora, menos satisfactoria. Compañía K es una obra poliédrica sobre la guerra. Un prisma con un descomunal número de car Resultaría mucho más sencillo escribir sobre un libro lineal. Por ejemplo: se conocen, se quieren, surgen conflictos y finalmente se casan. O por ejemplo: Un adolescente no encuentra su lugar en el mundo hasta que una serie de avatares solventan la situación. Sería más sencillo, sin lugar a dudas, escribir sobre algo así. Sin embargo, la lectura hubiese resultado menos enriquecedora, menos satisfactoria. Compañía K es una obra poliédrica sobre la guerra. Un prisma con un descomunal número de caras. Cada cara una voz. Cada voz una historia. Completamente razonable. ¿Acaso la guerra está compuesta por una sola voz? En ningún caso. En la guerra, como en todos los juegos, confluyen como mínimo un par de jugadores. Y cada pieza tiene su propia visión de lo que acontece. Sus principios, sus miedos, sus ilusiones. El caballo nunca será la torre. El alfil jamás será reina. El muerto no compartirá la visión del vivo. It's Remembrance Day here in Canada, a day set aside each year to show respect for veterans who served in the great wars. Politicians stand in front of war memorials and yap about young men making the ultimate sacrifice against the forces of evil. It's all very shallow, sappy and sacrosanct. But what was the Great War, anyhow? How, in these empty, symbolic gestures, has the real war been lost? WWI was a stupid, pointless war fought by a dying aristocracy. Millions of men snuffed out with mechanic It's Remembrance Day here in Canada, a day set aside each year to show respect for veterans who served in the great wars. Politicians stand in front of war memorials and yap about young men making the ultimate sacrifice against the forces of evil. It's all very shallow, sappy and sacrosanct. But what was the Great War, anyhow? How, in these empty, symbolic gestures, has the real war been lost? WWI was a stupid, pointless war fought by a dying aristocracy. Millions of men snuffed out with mechanical banality. William March (pen name of a serviceman, see Wikipedia for more) gives these men life and purpose. Company K comprises of every short chapters, each a vignette of war-time and afterwards, the survivors trying to regain a sense of normalcy. Hear the cries of the dying, bleeding out in no man's land. See a soldier commit an ironic murder of his commanding officer. Get the feels for a former piano prodigy, returned to small-town civilian life with less digits. Watch as a lovelorn soldier gets grifted by a French prostie. Even in the darkness, there are moments of laughter and levity. One of my favorite books, one that has accompanied me on every cross-country move, a piece of WWI literature that deserves far more recognition than it gets. Written by an decorated veteran of the Great War, Company K offers an semi-fictionalized account of the unit's experiences, from deployment to decades after the war ends. Each member of the group tells his own story in the first person, and each has a very different perspective, from deserters to cold-blooded murderers, philosophers to poli One of my favorite books, one that has accompanied me on every cross-country move, a piece of WWI literature that deserves far more recognition than it gets. Written by an decorated veteran of the Great War, Company K offers an semi-fictionalized account of the unit's experiences, from deployment to decades after the war ends. One of the best books I have ever read. A revelatory and soul jarring comment on the folly of war as we know it. The writing is exceptional and the style is totally fresh (to me at least). Read this book. 5 stars. Really good WWI book. A series of 113 very short (two or three pages) stories that interconnect. Surprised I'd never heard of this one before... its definitely up there with the other classic WWI books. In high school, the book that got me labeled a communist by my friend's dad. Should be read with Slaughterhouse-Five to ward off ignorance, arrogance, and tendencies of warmongering. Spesso parlo con diffidenza dei consigli del critico letterario A. D'Orrico (in realtà penso che il suo "peccato originale" sia stato aver enfaticamente salutato Faletti come "il più grande scrittore italiano". Lo so che l'autore è recentemente scomparso, ma non credo che rivedrò i miei pre-giudizi per questo. Da allora D'Orrico, per quanto mi riguarda, ha perso un po' di credibilità), ma bisogna dire che qualche volta ci azzecca(va). Questo Compagnia K era infatti da lui consigliato dalle colon Spesso parlo con diffidenza dei consigli del critico letterario A. D'Orrico (in realtà penso che il suo "peccato originale" sia stato aver enfaticamente salutato Faletti come "il più grande scrittore italiano". Lo so che l'autore è recentemente scomparso, ma non credo che rivedrò i miei pre-giudizi per questo. Da allora D'Orrico, per quanto mi riguarda, ha perso un po' di credibilità), ma bisogna dire che qualche volta ci azzecca(va). Questo Compagnia K era infatti da lui consigliato dalle colonne del settimanale del Corriere della Sera come uno dei "libri per l'estate 2010”: curiosa definizione, perché, come si vedrà, non è esattamente una lettura da ombrellone, ma nulla da eccepire sulla qualità. William March è un autore statunitense forse poco conosciuto da noi, ma discretamente noto in patria. Così come Chevallier, autore de La paura, era un reduce della prima guerra mondiale e, sempre per continuare coi parallelismi, anche Compagnia K, uscito nel 1933, inizialmente scandalizzò l'opinione pubblica per la violenza, l'antimilitarismo, il rifiuto di ogni retorica patriottarda. Col tempo, naturalmente, venne ampiamente rivalutato, fu un'importante ispirazione per il Vonnegut di Mattatoio n. 5 ed è in generale considerato uno dei capolavori della letteratura di guerra. Fu soprattutto, e si sente, un romanzo molto "sentito" e "sofferto" per il suo autore, che, come si legge nell'introduzione di Dario Morgante, non fu mai in grado di riprendersi totalmente dall'esperienza della guerra, che lo tormentò fino alla morte. La struttura del libro è inusuale: protagonisti del romanzo sono gli uomini della Compagnia K dell'esercito americano, ma la storia si dipana in brevi o brevissimi capitoletti, quasi mini-monologhi, in cui a turno ciascun soldato o ufficiale prende la parola, in prima persona. Uno alla volta, "sfilano" davanti a noi il soldato semplice Edward Romano, il tenente Edward Bartelstone, il soldato semplice William Anderson, il soldato semplice Benjamin Hunzinger, il sergente Julius Pelton, il soldato semplice Richard Mundy, e tanti altri (sono in tutto 115, cioè l'intera compagnia), ciascuno per raccontare il proprio pezzetto di storia, chi è stremato per i turni di guardia in trincea di ore e ore e ore, chi ha dovuto sparare su dei prigionieri inermi, chi si è ritrovato in mezzo a un attacco col gas, chi è morto in mezzo alla terra di nessuno. L'espediente di dare a ciascuno un nome e un cognome li rende più veri e "reali", eppure, allo stesso tempo, non impedisce che la loro testimonianza diventi per così dire "universale" (specialmente perché, come detto, anche i defunti partecipano a questo "rito" collettivo). L'unica, significativa eccezione è "il soldato sconosciuto" (p. 167), che muore rifiutandosi di rivelare il proprio nome, perché non entri a far parte di nessun elenco degli "eroi caduti". E dietro a ciascuno di questi nomi si può anche vedere un po' dello stesso William March che tenta di esorcizzare e guarire le proprie ferite. This novel is one of the unpatriotic novels about the First World War. Along with "All Quiet on the Western Front", "Three Soldiers" and "A Farewell to Arms", this novel broke through the barrier of war novels that served to glorify the side of a war on which its author had once fought. While I really enjoyed "All Quiet" and "Farewell", "Company K" was a bit too abstract for me. "Company K" is the story of an American Marine infantry company on during the First World War. It traces the experience This novel is one of the unpatriotic novels about the First World War. Along with "All Quiet on the Western Front", "Three Soldiers" and "A Farewell to Arms", this novel broke through the barrier of war novels that served to glorify the side of a war on which its author had once fought. While I really enjoyed "All Quiet" and "Farewell", "Company K" was a bit too abstract for me. "Company K" is the story of an American Marine infantry company on during the First World War. It traces the experiences of the members of the unit from training in the States, to the crossing of the Atlantic, through the war in the trenches in France, to the return to the States and the lives of the veterans of the company after the war. The story is told in the first person by each member of the company, which makes the narrative quite a bit disjointed. Furthermore, the personalities of the narrators do not seem to vary from each other, which is understandable given that each narrative only lasts a few pages, and there is not enough room to do anything like character development or plot development. The story covers some pretty disturbing ground. There are scenes involving the murder of officers by their own men, and men who are considering or about to commit desertion in the face of the enemy. One of the veterans of Company K commits a capital crime after the war and is executed in his narrative. Another tries to start an anti-war organization at home, but when the potential members of the group hear this veteran's stories of the war, they become filled with patriotic feeling and go out to enlist in the National Guard! This is probably the only piece of humor in this novel, and I don't believe that the author intended it to be humorous, but I found it to be funny. The bottom line here is that this is a hard book to read. The realities described by the author undoubtedly were real problems experienced by recruits, soldiers and veterans of the First World War. “Company K” is one of the more intense novels written about World War One; a bleak and direct narrative entirely void of sentiment or hope. In it, members of the army unit describe their experiences before, during and after the Great War. A hundred young men - hardly any of them having any experience on the battlefield - start their training filled with enthusiasm and bravery. But from the prologue, years after the war in which a conversation regarding the evil of murder is discussed, we know mo “Company K” is one of the more intense novels written about World War One; a bleak and direct narrative entirely void of sentiment or hope. In it, members of the army unit describe their experiences before, during and after the Great War. A hundred young men - hardly any of them having any experience on the battlefield - start their training filled with enthusiasm and bravery. But from the prologue, years after the war in which a conversation regarding the evil of murder is discussed, we know most of these men who will survive the war, will do so embittered, broken and lost. Through the 113 different voices, “Company K” becomes a panoramic collage of experiences during the war. Because of the extremely short chapters, it sometimes felt like I was skimming through a much larger novel, only reading a paragraph here and there. But even though that makes the story less coherent, it didn’t make the reading experience as a whole any less intense. Despite being a highly decorated WW1-veteran himself, author William March regarded war as pure evil, so most of the stories are mean, coldblooded chapters of madness without any hope or comfort. There turns out to be nothing patriotic about fighting in the name of freedom, nor do one’s actions on the ruined landscapes of France prove one’s courage or loyalty. “Company K” serves as an anti-war protest; and at the time, March was breaking barriers by using the pain of his PTSD in order to create this work of literature. This review has been hidden because it contains spoilers. To view it, click here. William March's Company K is a series of vignettes (113 in all) of the various members of this fictional (but no doubt autobiographical) WW1 US Marine company in France in 1918. When I first read this as a teenager, I found it entertaining, sad, and in parts disturbing. Every scene is described in stunning detail from one who could only have been an eye witness to the events described. The scene where they shot the freshly surrendered German prisoners in a ravine is told from a few view points, a William March's Company K is a series of vignettes (113 in all) of the various members of this fictional (but no doubt autobiographical) WW1 US Marine company in France in 1918. When I first read this as a teenager, I found it entertaining, sad, and in parts disturbing. Every scene is described in stunning detail from one who could only have been an eye witness to the events described. The scene where they shot the freshly surrendered German prisoners in a ravine is told from a few view points, and it is harrowing. The detachment and disillusionment of the post war vignettes of the lives of those that survived the horrors of the front is no less sad. The horrifically disfigured young soldier who insists on his pre-war fiancé honouring her promise to marry him - and the vividly painted scene of spending his wedding night at opposite ends of the room from his young bride, who is repulsed by his grotesque appearance and is sobbing hysterically at her predicament of being married to a "monster" left a crushing emotional impact on me when I first read it as a teenager. Vuonna 1933 ilmestynyt teos on melkeinpä pikemmin kertomuskokoelma kuin romaani. Kirjan 113 katkelmaa liittyvät kuitenkin toisiinsa ja kuvaavat ensimmäisen maailmansodan kulkua melko kronologisessakin kehyksessä yhdysvaltalaiskomppanian näkökulmasta. Tuloksena on rakenteeltaan kiinnostava ja modernilla tavalla yhtenäinen teos, joka pohjautuu kirjailijan omiin kokemuksiin. Juuri moniääninen rakenne mahdollistaa hienosti tekstin sävyvaihtelut. Toiset tapahtumat asettuvat koomiseen ja toiset hyvin Vuonna 1933 ilmestynyt teos on melkeinpä pikemmin kertomuskokoelma kuin romaani. Kirjan 113 katkelmaa liittyvät kuitenkin toisiinsa ja kuvaavat ensimmäisen maailmansodan kulkua melko kronologisessakin kehyksessä yhdysvaltalaiskomppanian näkökulmasta. Tuloksena on rakenteeltaan kiinnostava ja modernilla tavalla yhtenäinen teos, joka pohjautuu kirjailijan omiin kokemuksiin. Juuri moniääninen rakenne mahdollistaa hienosti tekstin sävyvaihtelut. Toiset tapahtumat asettuvat koomiseen ja toiset hyvin traagiseen valoon. Joskus realistinen asetelma saa absurdeja piirteitä. Muutama yksittäinen katkelma jäi kummittelemaan mieleen, kuten ”Tuntemattoman sotilaan” riipaiseva oivalluksen hetki keskellä taistelukenttää. 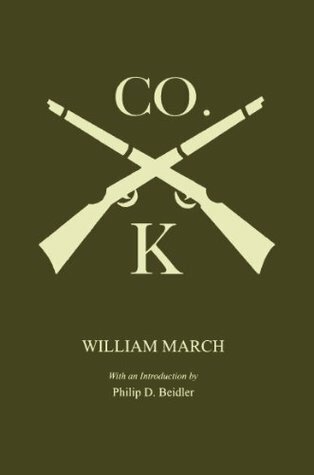 A “Band of Brothers” for the First World War, and a relatively rare glimpse into the experience of American Marines in the trenches, “Company K” is a vital and intense novel. Told through the eyes of 113 different soldiers in short chapters and comprised largely of experiences that the author witnessed himself during his time serving in France, “Company K” is an experience that is not easily forgotten. Once described as “an anthology of dismay” by Christopher Morley, I would venture that the shor A “Band of Brothers” for the First World War, and a relatively rare glimpse into the experience of American Marines in the trenches, “Company K” is a vital and intense novel. Told through the eyes of 113 different soldiers in short chapters and comprised largely of experiences that the author witnessed himself during his time serving in France, “Company K” is an experience that is not easily forgotten. Once described as “an anthology of dismay” by Christopher Morley, I would venture that the short cries that issue forth across each chapter are not only of dismay, but a full to bursting spectrum of all emotions. That's the thing with this singular and remarkable work, it is not so much a novel of war, but war itself rendered through the mouths of these men. It can be despairing, hopeful, violent, funny, tragic and dastardly at any moment. For me, March has achieved the purest form of war novel imaginable. One that is honest. It is not glorious, though glory is to be found, it is not condemning these men, though there are rogues amongst them. It merely allows them to speak so that they may not be forgotten. I can think of few better reasons to write than that. À travers de courts témoignages imaginaires mais documentés des soldats américains de la Compagnie K l'auteur donne une vision polyphonique de la guerre. Des tranchées, des tirs de barrages, de la violence subie, des refus, des traumatismes, on suit la compagnie jusqu'en Argonne puis vers la paix. L'après aux États Unis est rempli de fantômes, de spectres, de blessures et de quelques retrouvailles. Un roman qui confine au travail d'orfèvre. "Deeply affecting" doesn't begin to describe my feelings upon finishing this book, but it's the best I can do - all other words fail me. Though it is officially fiction, I do not doubt that most if not all of the accounts within are based on true events. "You can always tell an old battlefield where many men have lost their lives. The next Spring the green comes up greener and more luxuriant than on the surrounding countryside; the poppies are redder, the corn-flowers more blue. They grow over t "Deeply affecting" doesn't begin to describe my feelings upon finishing this book, but it's the best I can do - all other words fail me. Though it is officially fiction, I do not doubt that most if not all of the accounts within are based on true events. "You can always tell an old battlefield where many men have lost their lives. The next Spring the green comes up greener and more luxuriant than on the surrounding countryside; the poppies are redder, the corn-flowers more blue. They grow over the field and down the sides of the shell holes and lean, almost touching, across the abandoned trenches in a mass of color that ripples all day in the direction that the wind blows. They take the pits and scars out of the torn land and make it a sweet, sloping surface again. Take a wood, now, or a ravine: In a year's time you could never guess the things which had taken place there. I repeated my thoughts to my wife, but she said it was not difficult to understand about battlefields: The blood of the men killed on the field, and the bodies buried there, fertilize the ground and stimulate the growth of vegetation. That was all quite natural she said. This review has been hidden because it contains spoilers. To view it, click here. Less a review, more a place to drop notes. No good content follows. This work features a series of episodic narratives, each with separate, quickly-changing, intradiagetic narration. The Marines within each episode tell stories of, for the first 18 or so chapters, relatively positive anecdotes - from giddy fighting amongst themselves in the snow to successes at sea. The stories take a dramatic turn for darker narrative about 20 chapters in - telling intermittent stories of loss, death, and grie Less a review, more a place to drop notes. No good content follows. I had to read this book for my college honors history class, and let's just be clear, I did not enjoy this book. I'm not gonna lie in saying that I did like a few entries here and there, but the majority of it, like a good 80% of it, was just weird, and pointless. I don't recommend it if you aren't into the whole diary written type of book. I would give it a try if you are a history geek, since it was based off of WWI soldiers. RATING: TWO STARS; it was okish. This book is about the World War 1, pictured through the short stories told by 113 men belonging to the Company K. The stories give a grass-level look of the war in many places, at the same time building a bigger picture about the company itself, about the war and things that will follow the men back home after the war is finished. Very powerful book, which lingers in your mind long after reading and makes you wonder if war really is as necessary as it's said to be. 4 stars. amazing, simple character sketches, i think this book should be made mandatory for high school students to read. i will buy this book and read and study it, and make or remake a film about this book as it has alot of power. i think william march is a very under promoted writer. the bad seed was a powerful film from his book, but this one i think is even more powerful and timeless.